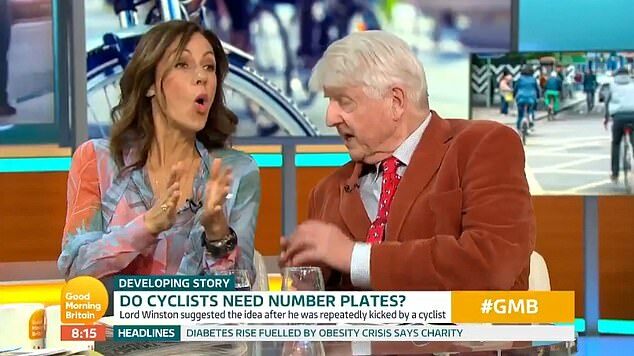 Piers Morgan slammed 'completely unaccountable' cyclists 'creating havoc' on the roads as he became embroiled in a debate with Stanley Johnson this morning. The pair were discussing proposals to licence cyclists in a debate sparked by Lord Winston, who called for the move following an altercation with a bike rider in central London last week. Johnson was joined on Good Morning Britain by presenter Julia Bradbury, who called for cyclists to be licensed amid a growing number of injuries, fatalities and disputes between riders and motorists. The debate came in the wake of Robert Winston demanding cyclists display licence plates after a woman attacked him when he challenged her for riding on the pavement. The Labour peer, who led the way in developing IVF, said the woman kicked him in the incident in central London.